A Channel 4 documentary has told the tale of a Northumbria University academic who has restored a ruined 200-year old church into a creative studio for artists, art students, actors and musicians. Head of Arts, Keith McIntyre, has restored a Grade B listed Parliamentary Church on the remote island of Berneray in the Outer Hebrides which was built in 1829 and fell out of use in the 1920s. 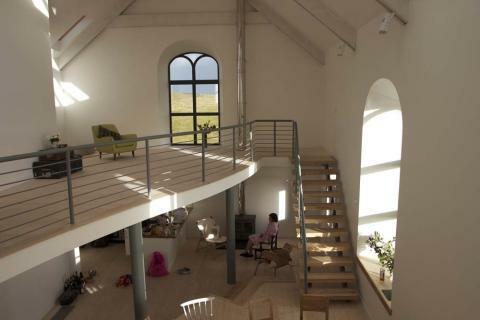 His ambitious project to re-build the roofless stone shell of the church into a new multi-disciplinary arts studio with living accommodation was broadcast on Channel 4’s The Restoration Man in January. Presented by architect George Clarke and produced by Tiger Aspect Productions, The Restoration Man series showcases the rescue of neglected architectural treasures across Britain. The restored building is one of Sir Thomas Telford’s Parliamentary Churches – a term referring to an 1823 Government commission which led to the erection of more than 30 churches in some of the most thinly populated and scattered parishes in the Highlands and Hebrides Islands. Keith and his wife, Sheenagh, used an inheritance from his late father to buy the listed church. 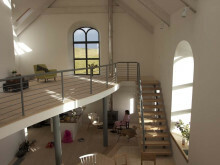 They worked in collaboration with Edinburgh architect Derek Patience to plan its renovation, restoring the derelict church into a new arts studio with living accommodation. He said: “I first saw the church five years ago and the hairs went up on the back of my neck when I walked up to this extraordinary building with fantastic views. I was staggered that no one had done anything with it so I started a long process of negotiating the purchase with the absentee owner. The actual building works only started on site in September 2011 and the project was finished in just over 12 months. “Channel 4 heard about our plans and contacted us, commissioning Tiger Aspect Productions in London to make a documentary for their Restoration Man series. Consequently we have been working closely with the programme presenter and architect George Clarke. Now completed, the studio will be open to Northumbria University art students, artists and musicians to be inspired by the light and rugged, desolate landscape of the island. 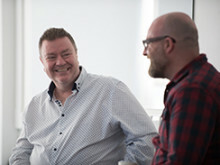 Keith, who is Head of Arts at Northumbria University, said: “My own practice and research crosses several arts subject disciplines. My aim was to create a space that was suitable as a production studio for drawing and painting but could also be used by small ensemble companies of theatre performers. “Lauren MacColl, a previous winner of BBC Folk Musician of the Year, will be rehearsing and recording her new album in the studio with her band in the next few months. I also want to explore the use of the building as a resource for students and colleagues, a kind of creative studio for short residencies and projects. 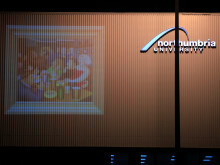 Artwork by some of Britain’s greatest artists has been projected on to a building on Northumbria University’s campus as part of a nationwide celebration of the BBC’s Your Paintings. The role of a Commissioning Editor was placed firmly under the student spotlight during Channel 4’s visit to Northumbria University, Newcastle. Do you have any worries about the condition of your home or want to make some home improvements and need some advice? 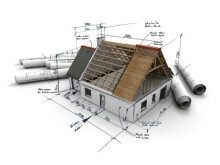 Free professional help may be available from Northumbria University’s Building Advice Centre.